other director in history: thirty-six. Out of these nominees, fourteen went on to win Oscars. 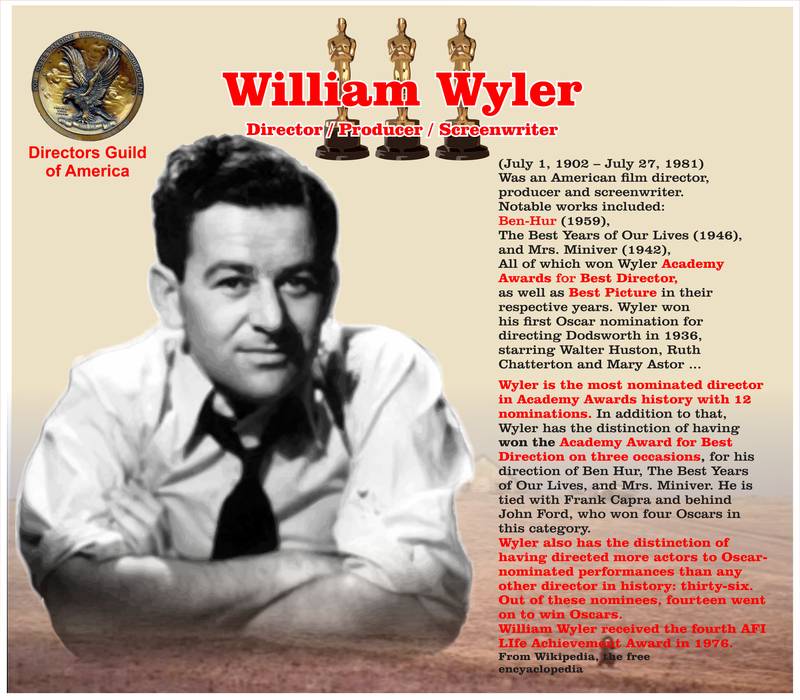 People laugh at these old Westerns now – from the 20’s, 30’s and 40’s – but that’s where we came from – and where Wyler paid his dues – and went on to become one of the most celebrated Directors in Movie history. What a great lineup of films!! One of my favorite westerns that I often forget. William Wyler was a master — along with THE master, Pappy Ford and George Stevens. One scene — among the many great shots — is especially memorable. The epic fist fight between Peck and Heston. Shot primarily in long shots with minimal sound. This was a style used by Wyler and George Stevens. Gregory Peck, I believe, was the Producer or “EP” on this one. Heston told me he didn’t blink about taking the 5th billing –after starring in “The Ten Commandments” because it gave him the chance to work with Wyler. Of course, the following year, “Chuck” starred for Wyler in “Ben Hur”. Heston who was a delightful guy (Just ask Marilyn) in his pre NRA years — said Wyler was perhaps the BEST director he ever worked for in his career. Great cast with the Ives-Bickford rivalry so very well done. Wonderful music!! Gotta watch it again. A definite Classic – worthy of repeated viewing. I’m working on a few of the bios right now (Ives, Heston, Peck …) and it’s a major task with a line-up like this. What a body of work these artists left us!!! Ives’ history is especially interesting as a wayfaring troubadour/activist in the 30’s who knew and played music with Guthrie, Seeger … was a member of the Weavers; wrote ‘Ghost RIders in the Sky’ … amazing stuff. Thanks for the notable and informed comments.